Family – The Ties That Bind…and Gag! I had never read Erma Bombeck until a literary agency’s query letter specifications required me to find comparable books. I Googled books about families with a strong humor element, wrote down the titles, and placed holds on them at my local library. I also visited Books-A-Million to find the titles my library didn’t own, and I read the book jacket flaps, the opening paragraphs, and random selections throughout the books. One novel in particular seemed like it was going to be close, but I just didn’t feel a connection with it. The comparison to my novel ended up being slim at best. I never finished reading it. I went back to the drawing board (Google) and refined my search for comparable books. I wanted truly funny family situations, the kind to which a reader could relate and which would make him or her laugh out loud. What I didn’t want were books that pushed someone’s social, political, or religious agenda or books that praised deep-seated dysfunctions in need of therapy and medication. Whatever I did returned a better selection of titles that weren’t just new books and authors, but many classic humor writers, too. And I discovered Erma Bombeck. I had heard about Mrs. Bombeck as a kid, and I’ve read snippets of her writing usually on refrigerator magnets or bookmarks. At first I worried that her writing would be considered too old or irrelevant to today’s family, or worse, today’s woman. After reading Family – The Ties That Bind…and Gag! I realized that Mrs. Bombeck’s humorous writing is every bit as relevant today as when it was first published. What appealed to me about Mrs. Bombeck’s writing was that she blended her role as a wife and mother into that of her writing career. She used the years she wasn’t writing for a paycheck to gather material for the times when she could. She made sacrifices without sacrificing her family, and it paid off in fifteen books, a humor column that appeared in nine hundred newspapers throughout the world, and an eleven-year guest appearance on ABC’s Good Morning, America. Mrs. Bombeck held twelve honorary doctorates, was appointed to the President’s Advisory Committee for Women, and was repeatedly named to The World Almanac’s annual list of the twenty five Most Influential Women in America. Pretty impressive for a housewife. Raising a family wasn’t something I put on my resume, but I have to ask myself, would I apply for the same job again? It was hard work. It was a lot of crud detail. It was steady. Lord, it was steady. But in retrospect, no matter what deeds my life yielded…no matter how many books I had written marched in a row on a library shelf, no matter how many printed words of mine dangled under magnets on refrigerator doors, I had done something rather extraordinary with my life as a mother. For three decades, I had been a matriarch of my own family…bonding them together, waiting for stragglers to grow up, catch up, or make up, mending verbal fences, adding a little glue for cohesion here, patching a few harsh exchanges there, and daily dispensing a potion of love and loyalty to something bigger than all of us. 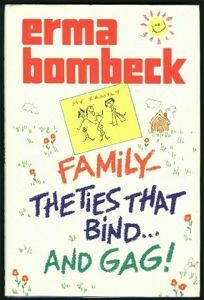 I cannot tell you how reassured I was to know that Mrs. Bombeck understood the importance of investing in her family. She understood that women aren’t defined by how much they earn or their status in life. She knew that the stay-at-home mother who didn’t make money doing what she did was every bit as important as the woman in the corporate boardroom pulling down millions. Family – The Ties That Bind…and Gag! was a truly satisfying read, and I hope women today will realize that the greatest thing they can do for themselves is to selflessly serve others. The rewards are endless. Don’t believe me? Reread Erma Bombeck’s list of accomplishments above.